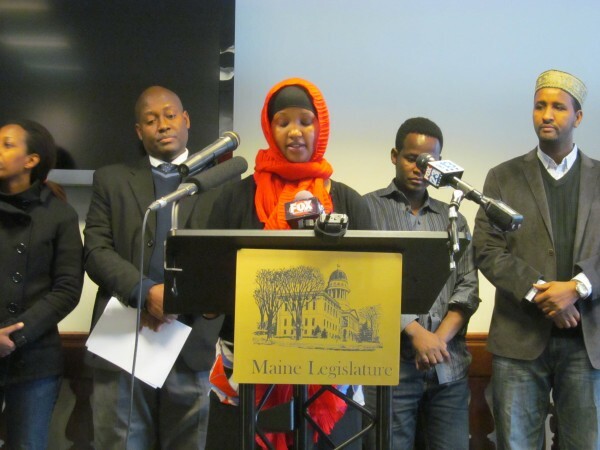 Fatuma Hussein, director of United Somali Women of Maine, tells reporters on Friday, January 10, 2014 in Augusta how a proposal by the Department of Health and Human Services to end general assistance to immigrants would devastate the immigrant community. AUGUSTA, Maine — Maine Attorney General Janet Mills has ruled that a proposal by Gov. Paul LePage to bar immigrants and asylum seekers from receiving General Assistance is illegal and unconstitutional. Health and Human Services Commissioner Mary Mayhew reacted with dismay and said she will continue to pursue implementation of the rule. The proposed new rule, which was unveiled late last year by the Maine Department of Health and Human Services, was meant to align qualification for the state’s General Assistance program with other public assistance programs such as Temporary Assistance for Needy Families and the Supplemental Nutrition Assistance Program. In essence, the proposal would block anyone from receiving General Assistance until they receive full U.S. citizenship. Mayhew said Friday in a written statement that she has revised the rule so that only illegal immigrants — and not legal noncitizens — would be barred from the General Assistance program. Tim Feeley, a spokesman for Attorney General Janet Mills, said Friday afternoon that Mills had received the revised rule and still will not sign off on it for the same legal grounds the original rule was rejected. Mayhew responded by saying the department will proceed with barring illegal aliens from receiving General Assistance anyway. “The department is confident it is on solid legal footing regarding the exclusion of illegal aliens from this welfare program and intends to move forward with enforcement,” said Mayhew in a written statement Friday evening. The rule would allow towns and cities to continue to provide the benefit, which is intended as an emergency measure to help individuals and families through financial crises, but without any financial support from the state. In most municipalities, the state pays 50 percent of the benefits, though there are three cities — Bangor, Portland and Lewiston — where state support ramps up to 90 percent after local spending reaches a certain threshold. General Assistance cost the state and local municipalities a total of $12 million in 2013 and provided an average benefit of $966 to approximately 12,000 people. About 64 percent of that cost was in the immigrant-heavy cities of Bangor, Lewiston and Portland. Opponents of the proposal, including Portland Mayor Michael Brennan, gathered in Portland on Friday morning to laud Mills’ decision. Mills, a Democrat who has frequently clashed with LePage, had her office issue a decision last week based around the assertion that there are three problems with the proposed rule, each of which is sufficient to prevent her from approving the change. The decision, which was researched and written by Assistant Attorney General Justin Barnard, said the proposal would violate the equal protection clauses in the Maine and U.S. constitutions, would create an unfunded mandate for municipalities that would be newly charged with investigating applicants’ immigration status, and is a substantive enough change to require legislative approval. Members of Maine’s immigrant communities said during an event at the State House in January that General Assistance can be a significant lifeline for some new Mainers — many of them asylum seekers — in their efforts to rebuild their lives after fleeing from war-torn or oppressive countries. General Assistance has been one of the programs at the center of the LePage administration’s efforts to reform welfare and social service programs. In 2012, the Legislature and LePage enacted a supplemental budget bill that called for recommendations to redesign the General Assistance program in a way that would save the state $500,000 in fiscal year 2013. A General Assistance work group studied the issue and in January 2013 presented a report identifying dozens of changes that would generate savings of more than $800,000. Many of the changes were adopted by the Legislature. LePage also proposed a bill earlier this year, LD 1844, that would have reduced reimbursement payments to towns and required monthly reporting by towns to the state. The bill died in committee. Last week, reforms to General Assistance came up again in an ongoing report by the Alexander Group, which was hired by the LePage administration to recommend a range of changes to social service programs. The recommendations suggested caps on how much the state pays for General Assistance. 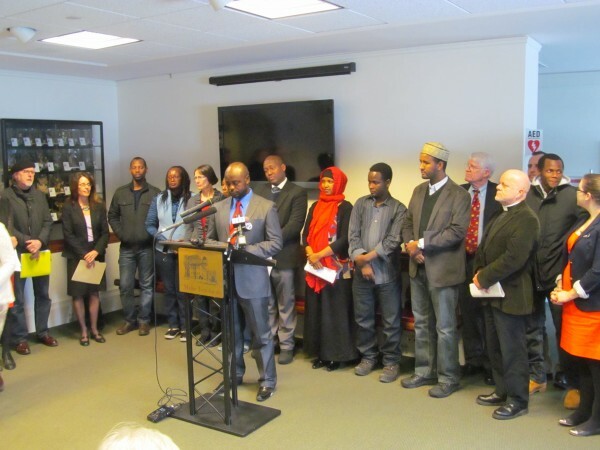 Alain Nahimana, coordinator of the Maine Immigrant Rights Coalition, said in a written statement Friday that in addition to Mills’ ruling, strong pushback on the issue definitely helped prevent the new rules from taking effect. Hundreds of people attended a DHHS hearing in January to oppose the rule change, and representatives later delivered more than 2,600 signatures from Maine residents urging rejection of the proposal, according to a news release. Alison Beyea, executive director of the American Civil Liberties Union of Maine, also applauded the decision. Correction: A previous version of this story incorrectly stated that the legal decision in opposition to the proposed rule changes in the General Assistance program was written by Attorney General Janet Mills. Though Mills signed off on the document, it was written by Assistant Attorney General Justin Barnard.